WARNING: Your Safety Depends On Carefully Following These Guidelines. wheels MUST have a 1” diameter arbor hole. 2. End flanges must securely clamp the buffs. Make certain they’re sized properly and exert enough pressureto secure the buffs. 3. Flanges MUST be installed with concave side toward buffs, and be large enough to cover the outer tips of the metal clinch ring teeth. The correct flanges are cupped. Flanges 4-1/2” in diameter and larger have ventilating holes in the cupped area. clamping of the buff and end flanges. 5. Shaft nuts must be firmly tightened with a wrench. 6. 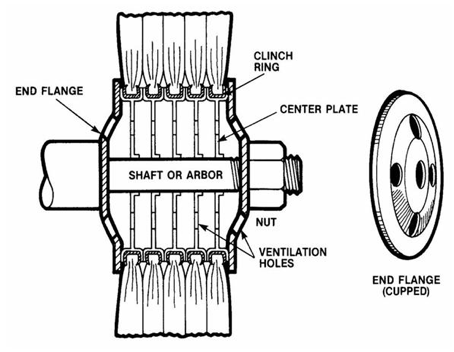 Shaft nuts must be periodically checked for tightness and re-tightened as necessary. 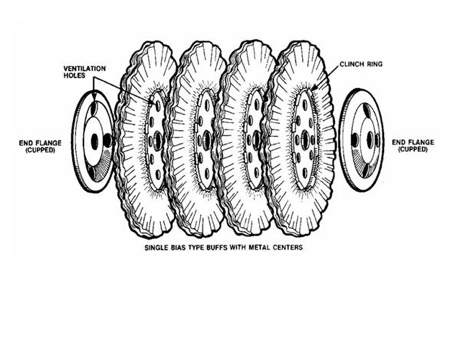 Spacers must be large enough to cover outside tips of clinch ring teeth, just like end flanges. entire clinch ring inside diameter. interlock areas do not prevent proper flange pressure on the buff. 8. NEVER exceed the maximum RPM ratings given in the chart below. 9. Check the machine manufacture’s guarding recommendations, and make certain they are followed. 10. Small and irregular parts should be buffed only while in proper holding fixtures or similar devices. 11. Avoid loose fitting clothes and NEVER reach over a rotating buff or fixture. 12. Don’t leave running machines unattended. 13. Read and observe all safety recommendations of the buffing machine manufacture, compound supplier, and your own safety department. Pay particular attention to rules concerning eye protection, hair, and hands such as wearing safety glasses, gloves, hairnets, aprons, respirators, etc. THESE RULES ARE MADE FOR YOUR PROTECTION. BE SAFE. FOLLOW THEM. Available only in special designs intended specifically for low RPM use. Tell Us What You Need – We Have A Polish For That!